Viennoiseries refers to breads, including the famous French croissants, that contain butter, milk, sugar and/or eggs in addition to the usual yeast and flour. They tend to be rich and sometimes sweet, but are not quite a dessert. They are usually eaten for breakfast and sometimes at tea time. If you can, buy them fresh from the bakery (called the boulangerie here in France) - perhaps as a special weekend treat. Brioche - An airy yeast bread containing eggs and butter. Can be plain (nature) or with bits of chocolate or raisins. Brioches are found in different shapes and sizes. Beignet - When found at a French bakery, a beignet is similar to a jelly doughnut. It can contain a cream or chocolate filling as well as different kinds of jam. Chouquette - Bite sized puff pastries sprinkled with sugar crystals. They are sold by the dozen or by the pound. They are similar to a cream puff but without the cream. Kids love them for snacks. Also good at tea time. Croissant - Perhaps the most common of viennoiseries, French croissants are made by layering butter on top of a pastry dough, folding it, rolling it out and repeating the process many times to finish with a many layered, buttery pastry. Usually if the croissant is straight it has been made with just butter and if it is curved it has been made with something else. Chausson au Pomme - Frequently found in French bakeries and eaten in the morning. These are made from layered pastry and filled with apple puree. Sometimes they will have a different fruit filling. Pain Au Lait - Small yeast breads containing milk, butter, and some sugar. They are either round or oblong. The kids like these with Nutella. Pain Au Raisin - Made from layered pastry dough (similar to a croissant), that has been rolled with a cream filling and raisins. Pain au Chocolat - Once again a layered pastry dough - this time it has a piece of dark choclate folded into the center. Buy from a good bakery that has baked the product earlier in the day. Packaged products do not come close to what a good baker makes. Warm baked goods for just a couple of minutes at 350° F. A microwave will not give good results. Croissants, chaussons, and pain chocolates are especially delicious when warmed. Viennoiseries are best eaten the day they were made. You can freeze all of these baked goods, but I'd recommend eating them within the month. I keep a stock in our freezer for breakfast. To defrost, take them out of the freezer 30 minutes before eating and finish by warming them in the oven. 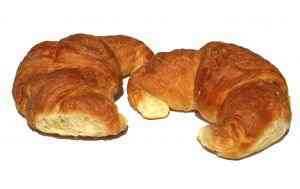 One generous sized butter croissant has about 400 calories and a lot of that is fat. Most people don't eat French croissants everyday, preferring something lighter for breakfast. Save them for Sunday morning brunch perhaps. Go from French croissants to French Foods.